A 2-room apartment with a small garden - for many tenants this is the ultimate. Even better if the garden area is directly connected to the kitchen. The currently rented apartment also makes a good overall impression - with two large rooms, a storage room and a bathroom with tub and plenty of natural. This kind of thing is usually not found in old buildings of this type. 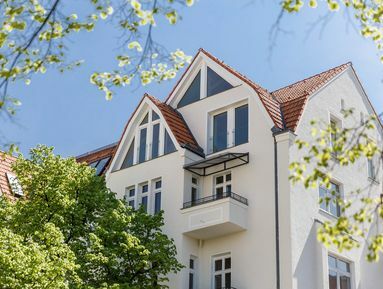 This offers you the opportunity to benefit from the development of the trendy Neukölln in a quiet, well-connected neighbourhood. Located in Neukölln’s Körnerkiez, the building lies on a peaceful residential street. Local, family owned businesses are abundant in this area, as is a unique, creative spirit that is hard to match. Close by is Körnerpark, a beautiful green space reminiscent of a palace garden. The larger area is famous for its vibrant atmosphere and array of quirky bars, restaurants, and shops. Around here, historic houses of Rixdorf, the community founded in 1737 by Bohemian refugees, can be found nestled alongside artists’ studios and lively new establishments. It is a place with a strong sense of community, where people from all walks of life find a place to call home.